Char-El - "Worlds Without End"
Based in Fostoria, Ohio, Char-el is the moniker used by electronic artist Charles Thaxton. Thaxton plays ambient meditational electronica that quietly explores the hidden nooks and crannies of the cosmos. 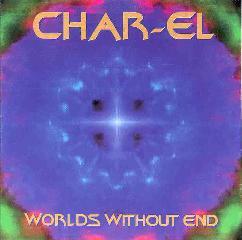 Worlds Without End brings together ten years of work on his first CD release as Char-el. Though this is Char-el's first release, Thaxton has been playing since 1970. He explored that era's progressive rock but was also influenced by electronic pioneers like Tomita, Larry Fast, and, or course, Tangerine Dream. Though Worlds Without End is firmly in the floating ambient electronica mold it seems that these influences have provided Thaxton with enough of a background in musical adventure that the music never descends into mere New Age fluff. Thaxton's background also includes the mid-80's Tangerine Dream influenced band Voyager which enjoyed some regional success in Arizona where he was living from 1981-1989. The music on Worlds Without End has a strong symphonic quality and I'm sure this would appeal to both ambient space fans as well as the prog rock crowd. Music of this nature likes to stretch out and explore so it's not surprising that the longer tracks like "The Ascending Light", "On The Run", and the title track are the most enjoyable. Not that the shorter tunes don't have good ideas, but this is music that takes you by the hand and leads you to new places. The journey is always better than the short jaunt. Of the shorter tracks, however, I think I liked "Aurora" best. It's a quiet ambient song much like the other tunes but I liked the way it wound down during its last couple minutes by building in pace but avoiding any change in intensity that might have jarred me from my trance. And I think AI readers would like the title track the best. Lots of freaky synth bleeps and blurps seem to represent numerous obstacles on this particular journey making for a little more adventure than I found on some of the other tracks. Prog rockers would probably like "Heart Light" best as it sounds like a spacier version of Camel or Steve Hackett's lighter moments. Recommended to electronica fans looking for inventive meditational music.